Switzerland produces sophisticated products, runs budget surpluses, maintains low inflation, possesses a strong currency, and excels at wealth management. These factors make it attractive to investors in times of turmoil, and lead to safe-haven capital inflows. During the Global Crisis and the Eurozone Crisis, these inflows intensified. Between the fourth quarter of 2007 and the third quarter of 2011, the Swiss real effective exchange rate appreciated by 30%. In September 2011, the Swiss National Bank set a floor of 1.2 Swiss francs to the euro. The real effective exchange rate then depreciated by 8% over the next quarter. In January 2015, the Swiss National Bank abandoned the floor and the Swiss franc soared. Thomas Jordan, chairman of the Swiss National Bank, reported that in June 2017 the franc remains significantly overvalued. How does the franc’s value affect Swiss exports and the Swiss economy? One might expect exchange rates to have a small impact on Swiss exports. As the IMF (2013: 18) stated, Switzerland’s “…exporting industries may be built around production of very specific items, which are particularly valued for their brands or special characteristics and hence face limited price competition”. In addition, as Sauré (2015) noted, the share of pharmaceutical goods in Swiss exports rose almost monotonically after 1989 and by 2011 exceeded 25%. Sauré observed that pharmaceutical products are often essential and covered by employees’ health insurance. Thus, the price elasticity of demand for these goods should be low. In a recent paper, we investigate how exchange-rate changes affect Swiss exports and the profitability of Swiss firms (Thorbecke and Kato 2017). We first examine the sophistication of Swiss exports. To do this, we use the methods of Hausmann et al. (2007) and Kwan (2002). We find that Switzerland has the most advanced export structure in the world in most years according to both measures. Watches and pharmaceutical products rank first and third, respectively, in terms of product sophistication, and 41% of Swiss exports in 2014 were in these categories. Switzerland’s export structure is also sophisticated according to OECD measures. The OECD categorises technology levels based on the ratio of research and development spending to value-added (see Hatzichronoglou 1997). According to this approach, 53% of Swiss manufacturing exports in 2014 were classified as high-technology goods. This was two-to-five times higher than the corresponding values for the G7 countries. We find no evidence that an appreciation of the Swiss franc would reduce exports of the most sophisticated products, watches and pharmaceutical products. For Swiss capital goods and equipment goods, on the other hand, we find that a 10% appreciation would reduce exports by 6%. Thus, exports of specialised machinery, precision instruments, machine tools, and other goods produced using Swiss engineering are vulnerable to appreciations. The recent 30% appreciation of the exchange rate thus put significant downward pressure on exports of these medium high-technology goods. We also report that GDP increases in importing countries cause large increases in Swiss exports. Exchange-rate appreciations can reduce the volume of exports. They can also compress the profit margins of exporters by forcing them to reduce their Swiss franc export prices. Figure 1 shows that, as the franc began appreciating at the end of 2007, Swiss franc export prices for capital goods tumbled relative to the Swiss franc costs of producing these goods. Swiss franc costs in the figure are proxied by the producer price index for capital goods. 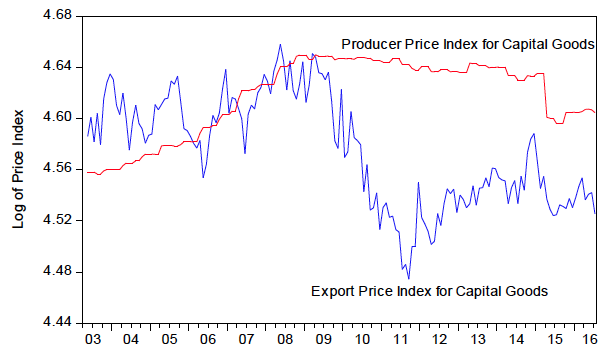 Note: Costs are proxied by the producer price index for capital goods. Sources: Swiss Federal Customs Administration and Swiss Federal Statistical Office. Regression results provide formal evidence on the relationship between exchange rates and export prices. They indicate that a 10% appreciation of the Swiss nominal effective exchange rate causes Swiss franc export prices for capital goods to fall by 4%. They also indicate that a 10% appreciation causes Swiss franc export prices for precision instruments to fall by more than 4%. On the other hand, there is no evidence that an appreciation of the franc causes the Swiss franc prices of watches to fall. Thus, the appreciation of the franc squeezed profit margins for companies producing medium-high-technology products such as capital goods and precision instruments, but not for companies producing high-technology products such as watches. We also investigate how changes in the franc affect industry stock returns. This can shed light on how exchange-rate changes affect profitability since economic theory posits that stock prices equal the expected present value of future net cash flows. We find that pharmaceutical stocks are not affected by a nominal appreciation of the franc relative to the euro, but that industrial machinery and other industrial stocks are among the most harmed. This provides additional evidence that the most research-intensive, high-technology products can weather exchange-rate increases, while medium-high-technology products remain exposed. Several policy lessons follow from the findings reported here. First, the results indicate that there is a tight relationship between Swiss exports and global GDP. The Swiss economy is dependent on exports because of its small domestic market. Therefore, Switzerland has a strong interest in the economic welfare of its trading partners. It should foster this by, for instance, maintaining free trade and scientific exchanges with developed countries and by sharing its expertise in areas such as healthcare and education with developing economies. Second, the findings indicate that the most advanced industries can maintain their exports and their profitability in the face of exchange-rate appreciation while medium-high-technology industries are likely to suffer tumbling exports and stock prices. Japan, like Switzerland, experienced safe-haven capital inflows and exchange-rate appreciation during the Global Crisis. Japan’s export structure contains fewer high-technology products and more medium high-technology products than that of Switzerland. One such medium-high-technology sector – electronics – was devastated by the strong yen after 2007 (e.g. Sato et al. 2013). Our results suggest that if Japan could upgrade its industrial structure to include more high-technology goods, it would be better able to handle the appreciations that accompany safe-haven inflows. Japan does not necessarily need to upgrade to the same goods that Switzerland produces, but rather to produce advanced goods that follow its comparative advantage. Finally, if the exchange rate is so important for Switzerland’s economy, it must be even more important for economies exporting labour-intensive goods and other lower-technology products. Politicians in each country thus have a strong incentive to pursue stealth devaluations to gain a larger share of limited world demand. [i] This can lead to conflict between trading partners and protectionism. Economists should focus on how to reform the international monetary system to encourage policymakers to pursue longer-run cosmopolitan interests rather than shorter-term nationalistic agendas. Hatzichronoglou, T (1997), “Revision of the high-technology sector and product classification”, OECD Science, Technology and Industry Working Paper No. 1997-02. Hausmann, R, J Hwang and D Rodrik (2007), “What you export matters”, Journal of Economic Growth 12: 1-25.
International Monetary Fund (2013), “Switzerland: Selected issues paper”, IMF Country Report No 13-129. Jordan, T (2017), “Introductory Remarks by Thomas Jordan”, 15 June. Kwan, C H (2002) “The rise of China and Asia’s flying geese pattern of economic development: An empirical analysis based on US import statistics”, Research Institute of Economy, Trade, and Industry Discussion Paper No. 02-E-009. Rodrik, D (2008), “The real exchange rate and economic growth”, Brookings Papers on Economic Activity 39: 365-412. Sauré, P (2015), “The resilient trade surplus, the pharmaceutical sector, and exchange rate assessments in Switzerland”, Peterson Institute for International Economics Working Paper No. 15-11. Sato, K, J Shimizu, N Shrestha and S Zhang (2013), “Industry-specific real effective exchange rates and export price competitiveness”, Asia Economic Policy Review 8: 298-325. Thorbecke, W and A Kato (2017), “Exchange rates and the Swiss economy”, Research Institute of Economy, Trade, and Industry Discussion Paper No. 17-E-064. Rodrik (2008) reports that exchange-rate undervaluations increase economic growth. He finds that exchange-rate undervaluations raise the share of the tradeable sector in total output. He then reports that the tradeable sector in developing countries tends to be inefficiently small because of government or market failures. He thus concludes that an undervalued exchange rate that increases the size of the tradeable sector will stimulate growth.